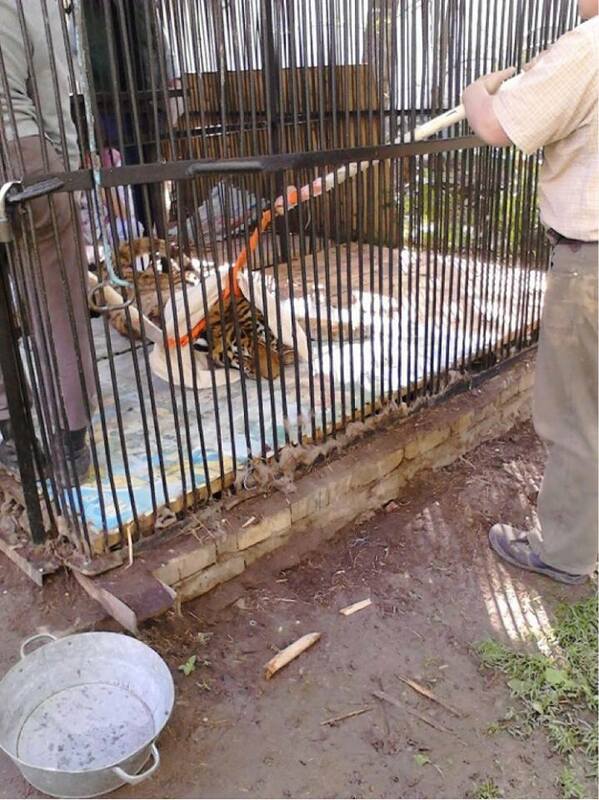 TIGER ROTTING TO DEATH treated with "enchanted water" in Kazakhstan zoo. 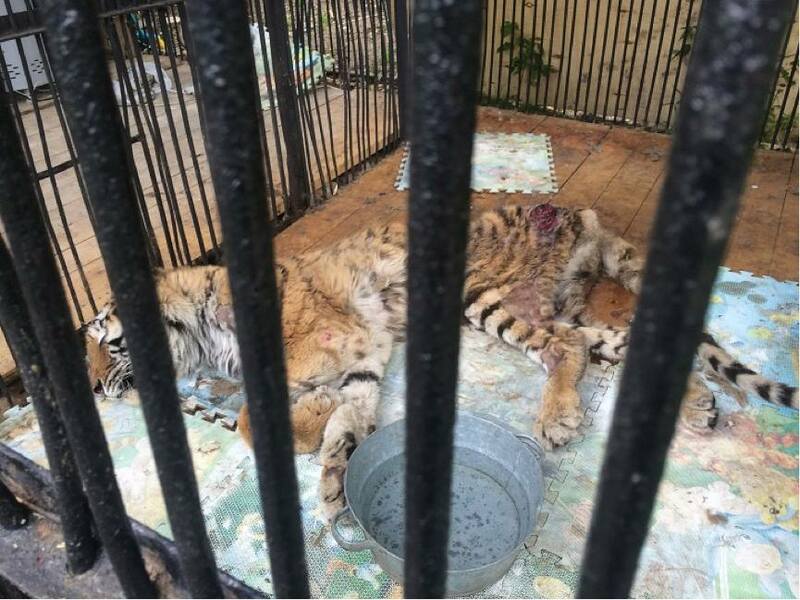 TIGER ROTTING TO DEATH treated with “enchanted water” in Kazakhstan zoo. April 29, 2016. Almaty Zoo, Kazakhstan. Warning: Upsetting Content. Once majestic beautiful beast, today, tigress named Kuralaj is hardly moving and barely reacts to people. Her body is covered with bedsores and bald patches. The dying animal, according to the zoo workers, is being treated with… “enchanted” water. Video. 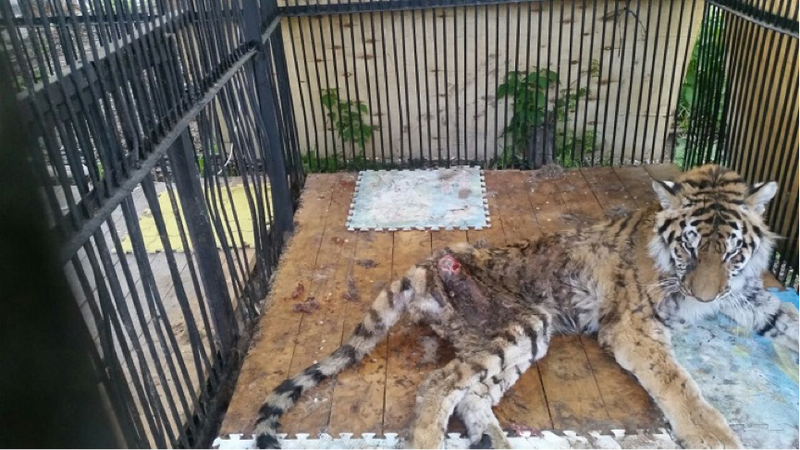 This and other horrors happening at Almaty zoo came to light thanks to a letter written by an angry and frustrated zoo employee addressed to the mayor of Almaty, Baurzhan Baibek. “The last drop, that made me write this letter was the sad fate of the tigress Kuralaj. The animal has been sick for a few months now. She had a chance to recover, but due to the director’s incompetence, she is simply left rotting to death. The zoo vets are not allowed (!?!) to treat the sick animal. Instead, her treatment comes from strangers, who do not work at the zoo and have neither a veterinary degree nor skills to treat animals. They treat her with “enchanted” water and massages. They tie her to a wooden board and handle her violently.” – the author states in his letter. According to the employee, because of this treatment the animal’s conditions have deteriorated and Kuralaj is almost on the deathbed. The tigress has developed bedsores and open wounds, her hind leg muscles atrophied. Unfortunately this, according to the employee, who has decided to appeal to the government, is not the only problem. “On zoo director Karimov’s orders the diets of all animals have been altered, many of the animals are suffering from malnutrition and are very skinny. The conditions of animals is obvious to everyone, including zoo visitors, – writes the disgruntled employee. The appeal also states that not only animals, but also employees of the zoo are in non-enviable condition. Due to presumed fire safety, the gas stoves, on which people on 24h shifts used to warm their meals, were removed in all sections of the zoo. There is no canteen either, no microwaves and a modest salary of 50-70 thousand tenge a month (a bit more than £100 – ed.) is not enough to eat at a café. People are regularly deprived of extra payments, many valuable and experienced emploees were dismissed. There is a very tense atmosphere in the team, people lost their motivation to work because they do not feel respected and appreciated. There is a constant threat of being fired or being deprived of extra payments, which creates constant pressure”. – says the author. There is no proper animal welfare legislation in Kazakhstan, which prevents any punishment of cruelty like this. Our charit is currently addressing Almaty mayor to take urgent action and is looking for collaborative authority figures who will take this matter seriously. An independent vet Dr. Alshinetsky from EARAZA (WAZA) flew in to look at the Kuralaj on May 4-5, he concluded that the Kuralaj was beyond saving and should be humanely euthanised. According to Dr. Alshinetsky, current treatment only aggravates the condition of the tigress. The tigeress is still alive due solely to the reserves of her body. “Amur tigers are very large animals, that have adapted to survive in adverse conditions, so the process of death cab be lengthy, – says the expert. 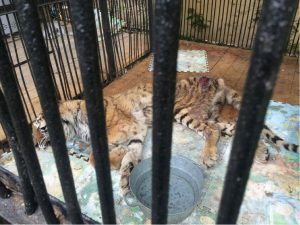 I believe that animal welfare issue can not be politicized and the Almaty Zoo, a member of the EAZA, is obliged to observe the code of ethics of the organization by providing Kuralaj “freedom from pain.” According to diagnosis by Alshinetsky, tigress can not be put through further investigation. The animal can not tolerate anesthesia. “In this situation, the most humane solution is euthanasia of the animal, which corresponds to the ethical principles of the EAZA and ensures to the animal one of the fundamental freedoms in captivity – freedom from pain. Unfortunately, the current state of the animal – the hard cachexia (wasting), the almost complete lack of mobility, bedsores – suggests that the animal is incurable and in pain and is slowly dying. The therapy has no positive effect “-. said in conclusion Michael Alshinetsky. Deputy director of Almaty Zoo Akbay Azhibaev thought he was more competent and experienced than the Senior Veterinarian of EARAZA (WAZA) Mikhail Alshinetsky. Zoo administration ignored clear recommendations to humanely euthanize Kuralaj, as she had no chance of surviving. They decided to continue her “treatment” instead. Last night Kuralaj’s body gave up not able to support the agony any longer. She is gone now and doesn’t suffer anymore. So, are Rada and Alkor next in line for a painful senseless death after 6 snow leopards, a chimpanzee, Kuralaj and who knows how many other animals we will never know about? The way the administration acted in this case demonstrates that the zoo has no potential for improvement. The only thing we can do now is make sure the people responsible for this are held accountable, that the zoo is brought under proper leadership, gets the right counselling and the remaining animals are examined and treated properly. Our charity will make every effort in our power to see this through.